A Merry Christmas wish bundled with a JustRite 20% off Coupon Code ! Today we would like to say Thank you for an awesome 2011!! It is because of our loyal fans and blog followers that our team gets to do what they love – create wonderful stamps and projects to inspire your creative juices!! As our way of saying Thank you we have a coupon code for you – JRSALE use all caps when entering this code at check out to receive 20% off your entire order (including 20% of all the items in the Super Sale Section of our website.) Sale ends Dec 19th at midnight EST. Coupon Code is valid for consumers and retailers. We hope that Santa will be able to use this coupon code to add a little JustRite under your Christmas Tree this year!! Wishing you and your family the happiest of Holidays!! For those of you who are still working on your Christmas Cards here are a few more JustRite Christmas Ideas that you might have missed from the web. Christmas Joy designed by Debbie Olson using O Christmas Tree and Marketplace Alphabet. Did you see this Merry Christmas Card designed by Darsie Bruno using Winter Words, Hugs to You, Vintage Oval Labels Set and the tag die from our Custom Die Nested Frame Dies. for the Shabby Tea Room Challenge. Darise was one of ten honorable mention winners for the challenge we sponsored at the Shabby Tea Room last week. With your sale coupon code you can purchase all of our custom dies for just $15.97 a 24.95 value!! This is our lowest price of the seaon on our custom dies. Before we announce the Friday Challenge Winners we wanted to announce that we are sponsoring the Shabby Tea Room Challenge this week. The challenge is to create a card or project inspired by this Winter Picnic photo and USE WHITE OR CREAM, NEUTRALS, SILVER AND GLITTER! ﻿ The lucky winner at the Shabby Tea Room Challenge will win this FAB JustRite Prize Package – $84.80 Value!! Here is just one of the FAB Shabby Tea Room Inspiration cards (designed by Debbie Marcinkiewicz) that you will find as inspiration pieces over at the Shabby Tea Room Challenge. Be sure to stop by and see all the Fab Cards the design created using our stamps!! Please link your creations at Shabby Tea Room Blog by Sunday, December 4th to play along. Winner and Tea Time Terrific Top Three will be announced on the Shabby Tea Room on Monday, December 5th. JustRite Friday Challenge #063 was to finish up (or get started!) on your holiday cards or tags. You can find the JustRite Friday Challenge #063 Pinterest Board here with all the entries. This week our judges for the Friday Challenge were - Barb Schram, Angela Barkhouse, Eva Dobilas, Kazan Clark and Kellie Fortin. 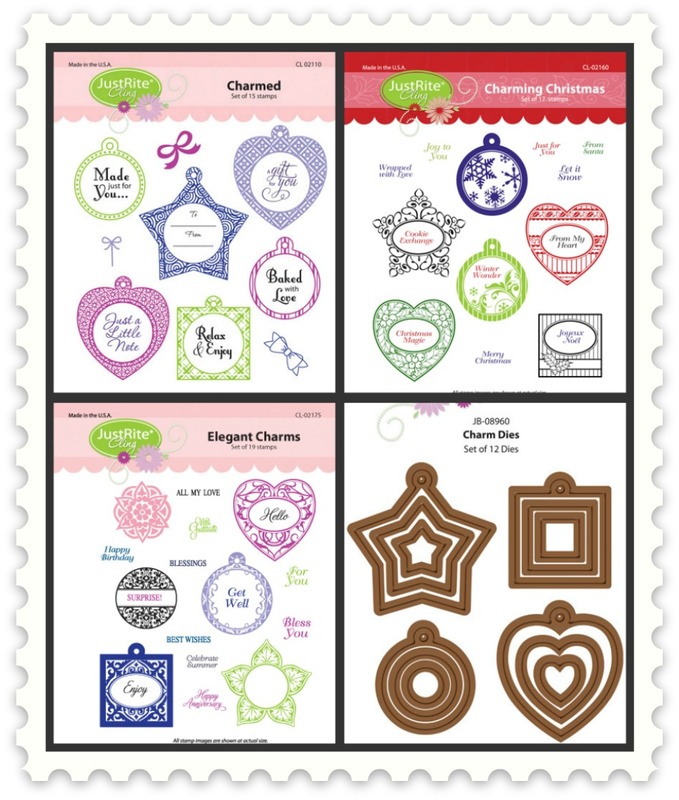 The grand prize for this challenge will be TWO sets of die templates from the JustRite webstore! THREE honorable mention winners will each receive ONE set of dies from our webstore! Beate Johns who created this incredible Christmas Gift Box. Cyndie who recycled a Blue Bonnet Ice Cream Container to create this awesome gift container. To see larger photos of all the winners visit our pinterest board here. Please email me – kellief@justritestampers.com with your die selections and your shipping information. Thanks to everyone who participated in this week's challenge and all of our challenges in this year. Our next Friday Challenge will be in January 2012!!! Enjoy the Holidays with your families! !